We made this meal on Sunday. I am a little late blogging about it because I have been super busy with gardening and animal projects. But I figured I should post about this one before I make the next one. 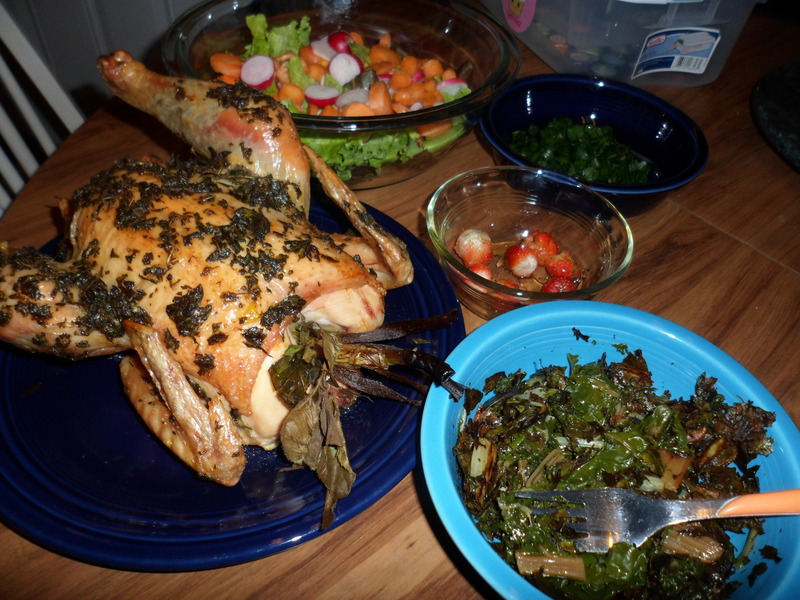 …This meal started with a trip to the farme’rs market on Saturday. We decided we wanted to have some local meat in this meal and the Decatur Farmer’s market (http://decaturfarmersmarket.com/wordpress/) is a good place to find lots of local foods. We got several things other than what is in this meal, like goat cheese, milk, and a sunchoke. We also had delicious falafels for lunch there. We should go more often. The chicken was prepared by rubbing it with a mushed up mixture of olive oil, bee balm, oregano and smoked salt and filling the cavity with an onion. Bee balm is a very good herb that is seldom used in cooking anymore. The Native Americans used it to flavor meats like poultry and venison, and for good reason. The flavor is great on meats. It is a very easy to grow plant, a good companion to tomatoes, brings all the bees to your yard and has interesting looking flowers. There is still no end in sight to the chard, but the garden has offered up a few new foods, as you can see – radishes and strawberries. With the lettuce, radishes, and carrots we made a simple salad. The chard was sauteed in butter and over cooked. We finished the meal with a few tart strawberries drizzled in blueberry honey. I picked the strawberries a little early because I wanted them so bad, and even not quite ripe they were delicious and added so much to the meal. In the next meal there should be lots more, and then pretty soon blackberries. I wish I had a tree that grew shortcakes!